If you’re just joining this series of posts, we’re about half way through and here’s the scoop. The character Grace Lightbourne, an impulsive and sometimes brazen Angel-in-Training from my novel Winging It!, is interviewing authors. Ordinarily, she usually slacks on her homework, so I’m exceptionally proud of her diligence. 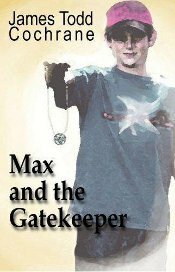 Today, we’ve got James Todd Cochrane, author of the teen adventure series Max and the Gatekeeper. Before I cut Grace loose, check out this description of the first book. A war has been waging for centuries; a magical and technological battle between good and evil. This conflict will affect life everywhere, but not everyone is aware it exists. When twelve-year old Max Rigdon is sent to stay with his grandfather for the summer, he unwillingly enters the fight. The day Max steps off the bus he is marked with an evil curse and immediately becomes the target of evil men and creatures with designs on ruling the universe. Not only does this curse cause Max physical pain but it allows his enemies to track and find him. He soon learns that the reason for this unwanted attention is because his grandfather is the keeper of a gateway; a powerful machine that makes travel to hundreds of strange unknown worlds possible. The enemy will do anything to gain possession of this power in their quest to control all worlds. With the help of his friend Cindy and others, Max must quickly learn the necessary skills to survive if he is to avoid the deadly trap that has been planned for him and his grandfather. A trap that has been decades in the making with Max as the missing piece. If successful it will change life as we know it. *to Shel, whispering* I heard what you said about me. Thanks, I think. *to James, cheery* Wow! I could almost hear music playing behind the product description! The book has very high stakes, so your Muse must be doing a great job inspiring you. What are you working with them on now? My Muse is telling me the 4th book in the Max and the Gatekeeper Series. If fact, I was actually really sad when, the other day, my Muse told me I had to kill off a main character. I actually felt the pain the other characters were going to feel, but I must obey my Muse. I actually see myself in a lot of my characters. Max is a teenager and I see a lot of me in him from when I was that age. Oh, that’s good, because I’m pretty sure Max isn’t gonna bite it. Should I change the subject? Is the death thing getting depressing? Okay. New topic. What’s your favorite book of all time? Excellent! And that book had some swoony-worthy characters, which is a really super lead-in to the next question. In your opinion what makes a guy character swoony-worthy? Being a guy myself, I haven’t ever thought about that. Don’t know that I have any swoony-worthy characters, but if I do that’s cool. It most definitely is cool. 😀 Here, let me ask you an easier question. If you could go to a rock concert in Heaven, who would you go see and just to be clear, you have to pick someone who is dead? Does it have to be a rock concert? I’d love to listen to some great composers. If it has to be a rock concert, I’d have to say Elvis. No, it doesn’t have to be a rock concert, and composers – practically all of them – are performing. But if you decide to go see Elvis, there’s already a group of authors going. (Heidi Hall, Marie Symeou and Cate Dean). Okay, Confession time, James Todd Cochrane. What’s your biggest writing sin? I don’t create outlines or time lines. I totally rely on my Muse to tell me what to write. Sometimes, my Muse amazes me on how things get tied in together. Yep, and just so you know, that’s basically the job. Now, would you say you’re more of a rule follower or a rebel? Why? I’m more of a rebel. I don’t like to be told what to do. I like advice but I’m going to do things my way. Except when it’s your Muse? Because you said you “must” obey, but you might have been kidding around. And when you don’t obey, are there other things that inspire you? That sounds like everything, which is very cool. So, what themes do you write about or what do you want readers to take from your books. That there is really good and evil in the world. You can be a force for one or the other, but there are consequences to our actions. That’s a very important truth and I hate to bring up the killing thing again…oh I’d just better zip my lips. Final question, James. Is there anything you’d like me to mention to your Guardian Angel? Cause I totally have contacts. Hardly anyone acknowledges that! You probably made your GA’s day! Thanks, Grace and James (who is a very nice guy, not a killer like Grace assumed. : D See what I mean about her personality?). Tomorrow the series continues with chick-lit author Sibel Hodge, so hope to see you back then. April 25, 2012. Tags: author interview, confessions., guardian angel, James Todd Cochrane, Max and the Gatekeeper, Shel Delisle, Winging It!. author interviews.